Team Usher broke a series-long Team Adam/Team Blake victory pattern on Tuesday’s THE VOICE finale, as Josh Kaufman was named the season 6 winner of the singing competition. THE VOICE has had strong finalists and semi-finalists over its six season run, but this year’s top 5 has one unique qualification, according to host/executive producer Carson Daly: there’s no clear-cut frontrunner. THE VOICE has its top 3 singers set for the finale. THE VOICE cuts are getting more and more brutal as the weeks go on (and the talent grows stronger), but even host Carson Daly was a little bit surprised to see early front-runner Matthew Schuler find himself in the bottom 3. The competition keeps heating up on THE VOICE, and while host/producer Carson Daly admitted he’s been sad to see the contestants go who have left so far, he also feels we’re in for some shocks as the following weeks come and the choice of who to cut becomes even more difficult. THE VOICE airs Mondays at 8 PM and Tuesdays at 9 PM on NBC. 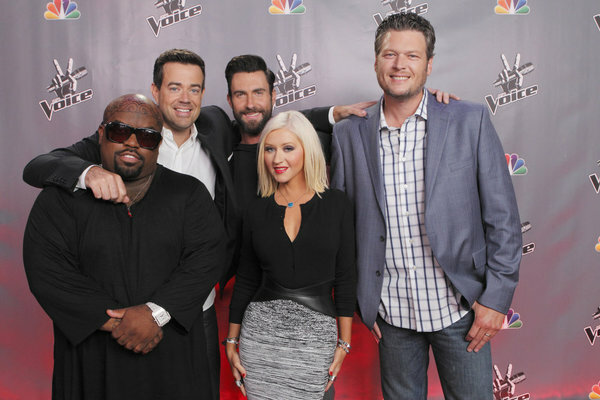 THE VOICE season 5 will reunite the original coaches, and to celebrate, there are new photos promoting the new cycle. THE VOICE season 5 kicks off Monday, September 23rd at 8 PM on NBC. THE VOICE has done some delightfully silly promos in the past, but this might take the cake. Is it wrong that this may be my new favorite thing?! For weeks, THE VOICE season 4 winner, Danielle Bradbery, was a consistent iTunes seller, with her show performances often cracking the top 10 best-selling single list. As such, when it came time to crown a victor — and with all those weeks of iTunes sales adding up for the finale — Bradbery’s win was reasonably expected.